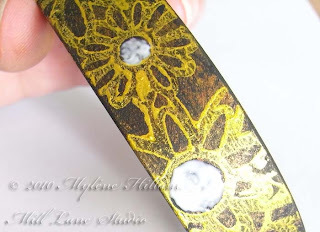 Today's featured product comes from Judikins who kindly gave me some Mica Gloss to work with. Mica Gloss is a pigment ink and comes in a range of 18 rich metallic colours. It has an almost irridescent look about it when it's applied to dark surfaces. So that's where I've started today. 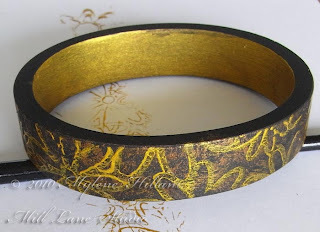 I gave the Diy Bangle a coat of black acrylic paint on all surfaces and let it dry. Next I stippled on some Gold and Chocolate Mica Gloss using a dry brush with just the very tips of the bristles dipped into the ink. 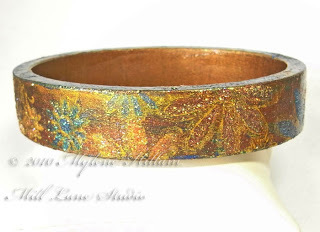 I also painted the inside of the bangle with a light coat of Gold Mica Gloss. and sprinkled them with brown glitter. 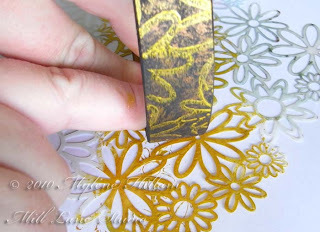 The glitter also adhered to the still slightly tacky daisies which helped to tone them down too. 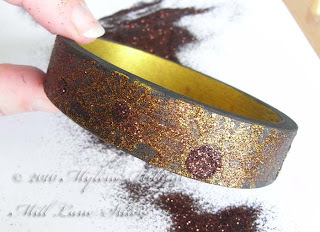 To remove the excess glitter I gave the bangle a sharp tap on the bench. 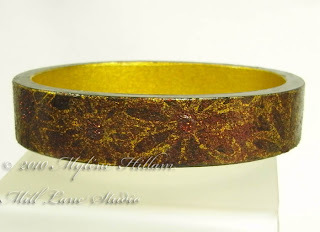 A coat of Diamond Glaze to make sure that the glitter stayed put finished off the bangle and also gave it a nice sheen. It dried in just 2 or 3 minutes - amazing stuff! 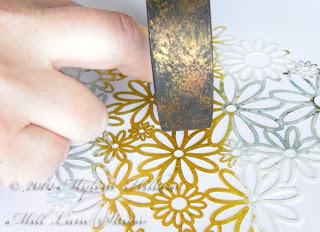 The finished bangle - Coming Up Daisies. 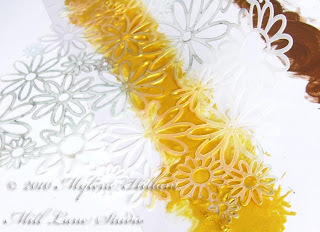 And here's a variation where the daisies are painted in different colours of Mica Gloss and sprinkled with a matching glitter. My thanks go to Judikins for supplying the Mica Gloss and Diamond Glaze used in this project. 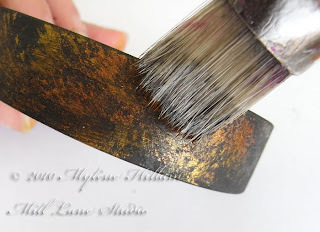 You can see more techniques using Mica Gloss on the Judikins website. Fabulous bangles and such a nifty stencil idea. Thanks Davinia. It's amazing what you can come up with when you don't have the supplies on hand that you normally like to use. It certainly gets you thinking outside the square or in this case, the oval!